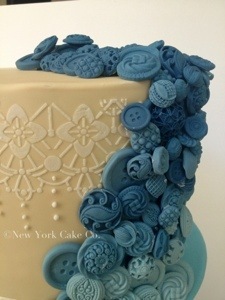 blue buttons | New York Cake Co.
Posted on October 12, 2013 by New York Cake Co.
Wow! It has been over a year since we’ve chatted! We have a lot to catch up on so… Let’s get to it! Well, we don’t need to discuss what has been keeping me away from posting. The 4-letter word in the company name is to blame… CAKE! My sincerest apologies, however the bright side is there will be plenty of sweet posts for you to read. Now that the apologies have been said. I MUST add that I am extremely thrilled to be back. I am ever more ecstatic that you have joined the New York Cake Co. journey of cake creations. So to those of you that have been following: thank you for your patience. To the new people who’ve recently come aboard: Welcome! There are hundreds of photos that I want to share with you! Where do I start? With a cake that has hundreds of blue edible buttons all over it. For days I was making blue buttons in four different shades to create this blue ombre of cascading buttons. They were created from little moulds that equate to hours and hours of sitting, kneading, pressing and pulling and repeat and repeat… Hopefully you get the idea! Sarah & Ivan met me at a local cafe to discuss their wedding cake. With me I brought some samples. They took the samples and said they’d continue to sample other companies and let me know in a few weeks. In a short time, Sarah called saying “Never before have I tasted such a smooth and light ganache, how can we book our order? !” Great! To Ivan & Sarah: Congratulations! 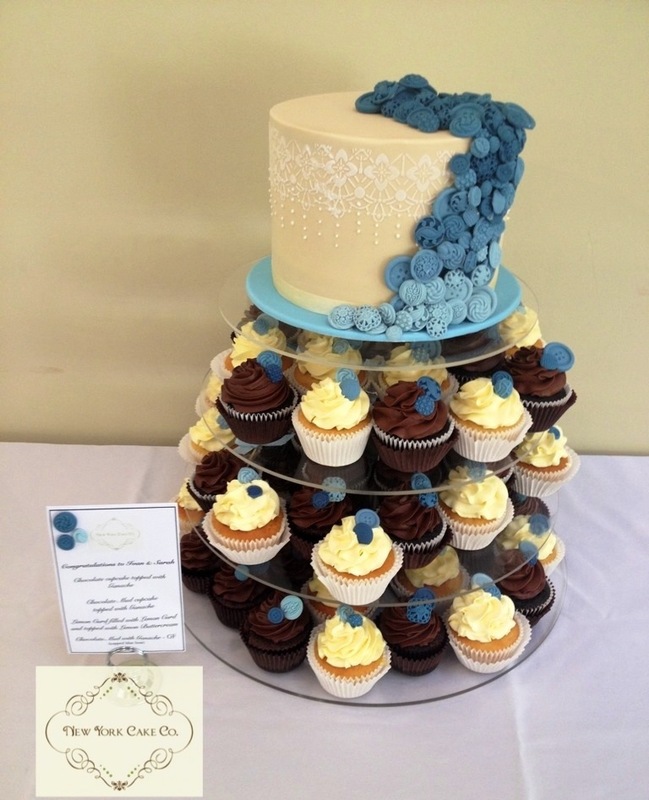 Posted in Specialty Cakes and tagged blue buttons, New York Cake Co, ombré, townsville, vintage buttons, weddings. Bookmark the permalink.